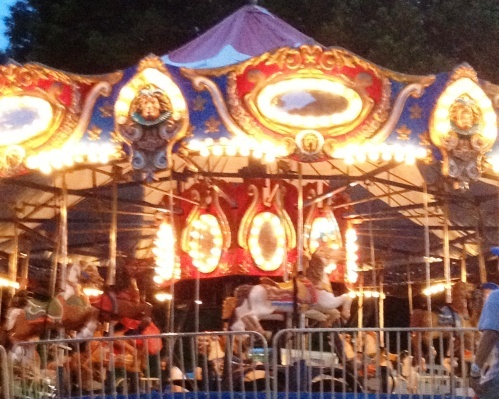 The carousel is always a popular attraction. General admission to the fair is $7 per person, children up to age 12 are free. Senior Citizens and Active Service men and women $5 per person (ID required). Tickets are available for purchase at the entrance and free parking is offered on and nearby the site. The three-day, family-friendly fair showcases many agricultural fair traditions including entries and exhibits for farm, animal, crafts, fruits, vegetables and more. The intimate size of the fair makes for easy navigation, parking and crowd control. Young fairgoers will enjoy children’s games offered on Saturday from 11 a.m. to 1 p.m., which will include a watermelon-eating contest, face-painting, three-legged race and prize winning contests. Visitors are invited to watch the traditional pony- and horse-pulls on Saturday at 2:30 and 7:30 p.m. and the oxen-pull on Sunday morning at 9 a.m.
Free on-stage music talent and entertainment is a growing Hamburg Fair highlight. From country to pop, fiddlers to funk, there is something for everyone who enjoys live music. The fair kicks off Friday evening music with performances in the amphitheater from country music favorites Katie Perkins and Branded. See many local young artists hosted by Music Now and Nightingale’s Showcase on Saturday afternoon including; Connected, Sophie Spaner, Jake Kulak and Braiden Sunshine. Saturday evening features local headliners Plywood Cowboy followed by Shiny Lapel Trio. Sunday afternoon concludes with the tradition of bluegrass and fiddling by Eight Mile River Band and the Old Time Fiddlers. Each year the Hamburg Fair honors a cherished community member. The 116th Hamburg Fair is dedicated in memory of Marita Knutson Rand, who proudly supported her community as a member and secretary of the Lyme Grange #147 and served as Hamburg Fair Committee Chairman and gatekeeper for over 30 years. Knutson Rand was well known in the community through her involvement in Lyme Girl Scouts, Sunday school teaching at the First Congregational Church of Lyme, American Legion Auxiliary, Lymes’ General Store as a partner and Old Lyme Pharmacy Gift as shop manager for 35 years. Highlighted sponsors of the Hamburg Fair include Reynolds’ Subaru, Hamilton Point Investments, GeoMatrix, Essex Savings Bank, Connected Systems, Guilford Savings Bank, Bogaert Construction, Middlesex Hospital, Lyme Public Hall Association, Wind River Environmental, Maddy Mattson Coldwell Banker, Block Design Build, Sapia Builders, Ring’s End, New England Power Equipment and Tiffany Built. Visit www.hamburgfair.org for fair schedule, exhibit entry, and more information. The 116th Hamburg Fair is hosted by Lyme Grange #147 and organized by many local volunteers to build community relationships and create lasting family memories.